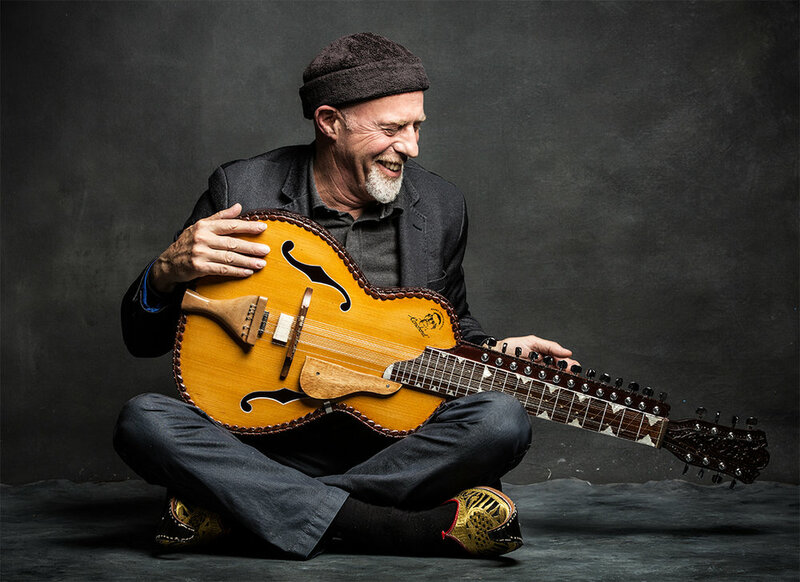 Canadian multi-­instrumentalist Harry Manx returns to his fans in Australia with his newest take on his ‘Blues meets Ragas’ explorations. On this 12th tour down under, Harry will perform at the Port Fairy Folk Festival and The Blue Mountains Music Festival in Katoomba as well as sideshows in all major cities and many towns in between. In his most recent recording, ‘Faith Lift’, Harry incorporates a String Quartet creating cross-­‐cultural music that references and expands both Indian and western music, and shifts the feel and subtext of his unique sound. As Harry says, ‘the strings give my music such an amazing lift, it feels like I have wings’. Sitting centre stage playing drums and guitars, Harry drives the rhythms forward with deep grooves, soulful patterns and spacious tones. Using his 21-­‐stringed mohan veena (Indian slide guitar), a National steel guitar, a banjo, cigar box guitar, his voice, and harmonica to lay down his audible vision, the music carries the audience in a trance-­‐like state. The lyrics draw from the works of the mystic poets with words of inspiration woven into story lines about everyday people. Harry will be presenting his solo show at The Old Museum a few days after appearing at this years Byron Bay Bluesfest. A worldwide festival favorite known for his droll humour as well as musical originality, Harry’s 15 albums and ceaseless touring have seen him earn a slew of Maple Leaf, Juno and Canadian Folk Awards, nominations, and accolades from musicians and fans worldwide.